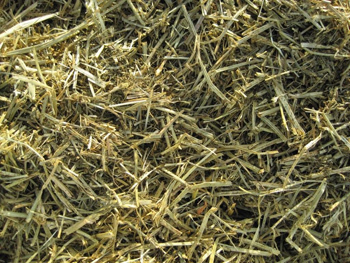 Triple Crown Premium forages should be fed at a minimum rate of 1% to 1.5% of body weight (10 lbs. to 15 lbs. on a 1000 lb. horse) per day if using as a complete hay replacement. Feed 4 lbs. to 6 lbs. per day if using as a supplement to normal long stem hay. Feed separately in a feed bin or bucket, or mix with your grain ration. Mixing may help reduce rapid consumption (bolting) and slow the digestive passage through the gut to maximize digestion. NOTE: Provide plenty of fresh, clean water at all times. Keep product fresh in cool, dry storage. Examine product daily. DO NOT use product that is old, or contaminated with mold, insects or foreign material. Watch the Forage Processing Plant Video. I tried this for 1 of my boarder's horses, a 30 year old mare with poor dentition. She quids most of her regular orchard grass, increasing her colic risk and reducing the nutrition received. We soak this in water for a few hours prior to feeding it, add a bit of senior feed and her supplements. She loves her soup and looks better than she has in years.